Mountain House Moveable Feast Giveaway! Mountain House pouches and cans, including an “old” can from the food storage room. Mountain House freeze dried foods are some of my very favorite pre-made food storage meals, and today I’m hosting the Mountain House Moveable Feast where one of you, my lucky readers, will win a Just in Case Classic Assortment Bucket of meals from Mountain House! 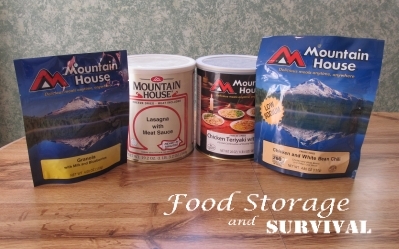 Why do you want Mountain House meals in your food storage? Well, here’s ten reasons I have them in mine. Mountain House is produced by Oregon Freeze Dry who have been making freeze dried meals since before I was born. This company knows freeze drying like no other. Sometimes you just won’t have the time or energy to make a meal from scratch in an emergency. Some brands of survival meals require cooking, but Mountain House meals just need hot water added and a little soak time and presto! A hot meal. Easy. Real meat. None of that crazy TVP stuff. Breakfasts! Scrambled eggs with ham and bell peppers, scrambled eggs with bacon, granola with milk and blueberries, and a breakfast skillet mix. You can even cook and eat the meal right out of the pouch. No dishes? Sign me up! Pouches are lightweight and perfect for a 72 hour emergency kit or bug out bag. Shelf life on pouches is 10+ years, meaning I don’t have to rotate my emergency kit foods every six months. The foods are also available in #10 cans. Reduced cost per meal, flexible serving sizes, reduced storage space needed, and increased shelf life: 25+ years on cans! Even the kids will eat the lasagna with meat sauce, macaroni and cheese, turkey tetrazzini, and chicken a la king! And my kids are crazy picky about their food. Leave a comment on my blog. It does not need to be on this post! Hit some of the popular posts (list on the left sidebar), or use the search bar at the top right or category menu for something you’re interested in reading. That’s it! Super easy. The giveaway will run through midnight next Monday, December 16th and the winner will be contacted shortly after it ends. Good luck! I recently started following all of your boards on Pinterest and wanted to thank you for the wealth of information you share and pass along to all who think forward and prepare for the future. Season’s Greetings and Bless You! Looks like a great prize package! Thank you for hosting the giveaway! a bucket of freeze dried food, and a Kelly Kettle… even if you are snowbound you can still celebrate the feast of your favorite saint. Thanks for a chance to win this! Please count me in on the Mountain House Just In Case Kit giveaway. They make great food, been using it since my old days in Boy Scouts. Thanks for the chance! Thanks for a great giveaway! I have tried MH granola and it is awesome! Great giveaway, thank you for your generosity! Very grateful for no TVP (I cannot tolerate soy). Thank you! Thank you for the chance to win. This is an awesome gift! I’ll have to try Mountain House. My husband got me some Auganson Farms cheese powder and strawberries to try, and I’m iffy. The cheese was okay for making Mac and Cheese, but the strawberries had this horrid aftertaste. This would be a great win! Thanks for the opportunity to win a super prize. What an awesome giveaway. Love the idea of grab and go bucket of meals. I learned a lot about Mountain House from this post. Thanks. What a great giveaway. Thanks for the chance to win. I would like to thank you for posting about Mountain House and for offering this prize. Mountain House is a great producer of quality freeze dried survival food. I love this giveaway. Storm just passed thru and we were snowbound. Glad I had supplies in the house. Nice to know the bags have a shelf life of 10+ years. I really love Mountain House! I don’t have ant freeze-dried food in storage yet. This would be a great start. Thanks for the chance. Thanks so much for the chance at this awesome giveaway! Have been wanting to try this; awesome givewaway! Great prize and great website. fabulous prize, thanks so much! Wonderful prize, Thank you, also, for your informative articles & links. I have been nervous about pre-made food, but I trust you, so I know these will be good meals. I would love to win this! Great job! Now this is very sweet thing to giveaway as a prize. Thank you! Great giveaway, and I could really use it! This is a fantastic giveaway. These could come in handy real soon! This would be an awesome Christmas Gift, this year we aren’t doing presents because we can’t afford it, my son and I became disabled this year and are fighting our way through the system to get benefits, but have not received any yet. Great giveaway! Thank you for the opportunity. I’m new to prepping, but really interested in being prepared. This is a great thing to have just in case. Thanks for 11 essentials for your trunk for winter preparedness! Excellent info for everyone! What a great opportunity – perfect for next year’s hurricane season. Thank you for the opportunity. We would love to try your product. Awesome I hope I win. Oooo, what a treat this would be. Thanks for the give a way! I really enjoy your blog and facebook posts too! Great giveaway, thank you for hosting it! Haven’t tried Mountain House yet. This would be a great way to do it! Thank you so much for the opportunity to win this prize. Good luck everyone. I would love to try your product. it would be nice to try different food’s to see witch ones you would order .I am sure it’s the one’s that a person loves the most.I like that it’s so convenient . Thanks for everything you do and this awesome opportunity! Thanks for offering the awesome contest ! Looks great! Thanks for the fun contest and offer! Thank you for offering this giveaway from Mountain House. I have recently become interested in having extra supplies for the family. I am glad I found your site. My favorite backpacking food and its just great to have around, in my backpack and in my day pack. Great food that tastes great. Awesome prize! My husband and I love Mountain House. We pack up some of their meals whenever we go camping. I like freeze dried foods for my hurricane evacuation kit. Easy to carry. Thanks I love this stuff for when I’m up camped out in the mountains. Would love to win this great prize! Want to try these! hope I win! Just getting into food storage and would love to win this! This looks incredible! I’ve been working on food storage for our family of 8 – this would be a great addition! Thanks for the contest! this is exactly what i’d like to find under the tree! Awesome! Just tried a sample and we love this stuff! Excellent giveaway … Thank You for the chance. Thanks for the giveaway, how cool is that! great give away would really like to try this product! Thank you for this giveaway…. Love your products! Merry Christmas and Blessings of prosperity in the coming year! Very cool! Would LOVE to have one of these! Thanks for the opportunity! Great prize! Would love to win! Thank you for all the chances! I’ve never bought prepared food for storage, but I sure am curious to try it. There are lots of things I can’t grow/preserve myself, so need to round out the wares. Thanks for the giveaway. This would be great to have on hand! 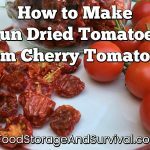 <3 freeze dried storage! This is a great prize. Wow, what a great giveaway! THANK YOU!!! Great prize. Mountain house is long lasting and lightweight! and it tastes good too! This is an awesome give a way! Hope I win, YAY! Thanks for all you do! You are awesome! Awesome giveaway….thank you for the chances to win….Merry Christmas! Great prize – Hope I win!! Thank you for the chance! always wanted to try these and have on hand for an emergency. Living in a very rural mountain region w/ 2 little ones is alot of stress…especially in the winter. This would be a great addition to all of the canned goods in the storage cupboard. Great Product for Survival or just outdoor necessities. Product tastes great and it’s so easy to use. Thank you for the giveaway! Thank you for this great prize. What a wonderful gift! Thank you for the opportunity! This would be a great way to get started with my Hurricane supplies for next year. I’ve been wanting to start food storage, and winning this would be a good way to start. I was unaware of this product till now. Definitely gettin some whether I win or not. Thank you. I love Mt. House.. thanks for the give away! Awesome prize!! Thanks for the chance!!! Thank you – would love to be able to compare brands before making the big commitment. Love all the great ideas ! Thanks for the chance at such a great giveaway! Merry Christmas! Thank you for being there! And thanks for all the information! Great giveaway, hope I win. Thanks! Looks like a great giveaway!! Thanks. Great giveaway! We use Mountain House and regular MREs when my son goes out on FTXs with his Civil Air Patrol squadron. I do keep some of the MH products for the family when we buy more than what he needs for the weekend. This would make a great addition to the family stash. Thanks. Thanks so much for the opportunity. thanks for doing giveaways ! sure this will come in handy !! Perfect giveaway for these hard times! Would love to win – thanks! Thanks for this opportunity and for all of this information! Thank You so Much for the chance to win something i NEED SO BADLY!!!! Thank you for a chance to try this! I have been a fan, follower, and customer for several years. Thank you for being a name that can be trusted! Never win anything…someday my luck will change! thanks for the wonderful giveaway! Merry Christmas! Looking forward to opening some these foods. Oh I hope I win!!!! My daughter and I really could use it! Merry Christmas and Thanks for the great giveaway! This would be the most awesome Christmas present next to the ones my wife gives my of course. This would be so awesome to win. Thank you for the great giveaway. I hope I win!! Just found this site as well, trying to shift from traditional eating that harms and kills and move to more healthy substitutes and for food storage, yea! I have tried a few other long term food products. I would love a chance to try Mountain House!! I’m relieved I knew the answer to my math question prompt :) I love everything I’ve tried from Mountain House. Thanks for the giveaway! Would love to win this. Thank you for the opportunity. Giveaway is great! Nice chance to win something for the storage. This sounds like some very tasty food. Thanks for the opportunity to try and win some. Awesome giveaway, awesome food. Thank you! Praying for this wonderful gift!! Lovely. I’d love to win this! That is a really nice giveaway. Too bad I wasn’t able to join. Hope you’ll have another one.